Tonight Caroline and I were both interviewed for our local news, then she cooked and ate her winning recipe for the camera. 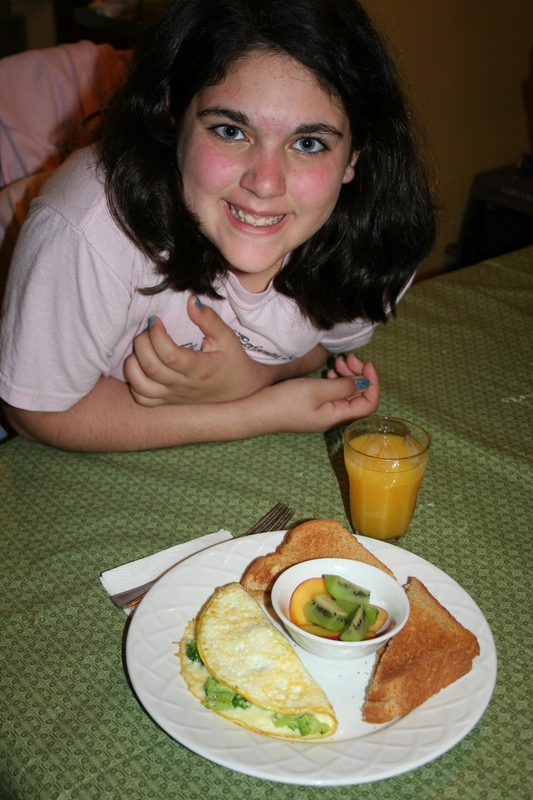 Well today has been quite the whirlwind day and as I finally sat down tonight to figure out what recipe to post for my What’s for Dinner Wednesday post, I could only think of one: Caroline’s winning recipe for her Egg White Omelet. The reason I could only think of this one recipe is because our whirlwind day has consisted of press releases, phone calls from Senators and news stations, emails from food columnists and radio hosts. It’s really been quite the day. And you should have seen how fast we cleaned our house when we learned that TV cameras were coming in three hours or less. Jennifer Mobilia of Channel 12 and Channel 11 News was in our house this evening! Yup, tonight one of our local news stations stopped by our house to interview Caroline and I for the 10 pm and 11 pm news broadcasts. It was such a fun experience and we’re sitting now as I type this, waiting for it to air in less than a half an hour. Another exciting thing happening here this week was the arrival of our official invitation from Michelle Obama, inviting us to the White House for the Kids’ State Dinner this coming Monday. Our hands were shaking as we opened the envelope! The arrival of the invitation from Mrs. Obama really made everything seem real! So, with all of that being said, I thought it only appropriate to share with you Caroline’s official recipe for today’s post. Enjoy! We came up with this lunch recipe because Caroline prefers egg whites instead of regular eggs, and she likes broccoli quite a bit. This meal is healthy as well as tasty. When choosing our ingredients we tried to use healthier alternatives: Mozzarella Cheese has less fat than American Cheese, wheat toast is better for you than white toast, and we added a side of mixed fruits and orange juice in order to tie in all of the food groups. A healthy recipe for any meal of the day and good enough for the First Lady to eat! 1) Separate eggs, place your whites into a small bowl. 2) Preheat non-stick frying pan, lightly coated with cooking spray, over medium heat. 3) Pour egg whites into frying pan. 4) When whites are semi-solid, place cooked, chopped broccoli onto one half of the pan of whites, leaving the other side of the omelet empty. 5) Sprinkle shredded Mozzarella Cheese over broccoli. 6) Place entire frying pan under the broiler for about five minutes or until cheese is melted and egg whites are solid. Edges of the omelet will be lightly browned. 7) Remove pan from broiler and place the omelet on a serving plate, folding the omelet in half so that the empty side now covers the side with broccoli and cheese. 8) Serve with a side of wheat toast, mixed fruit and orange juice. Thanks Jen! Let us know if you try it!